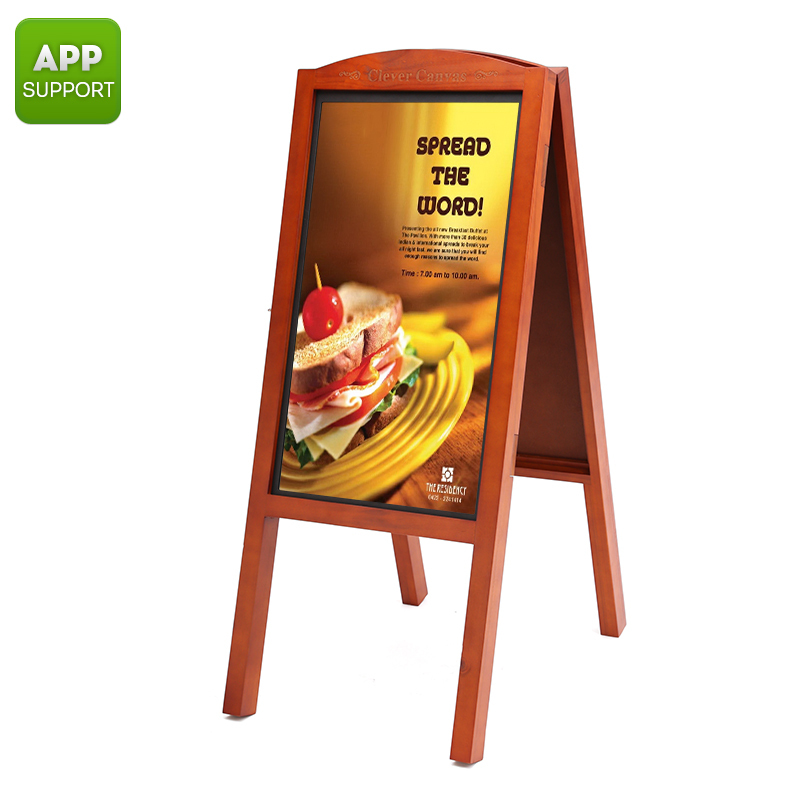 Successfully Added 27 Inch Full HD Sign - Android OS, Wooden A-Board, Audio Out, iOS + Android App to your Shopping Cart. This 27 inch full HD display board the perfect electronic signage solution for any restaurants, shops, bars, cafes or shopping centers. With a full color, 1080P display it will catch the attention of customers and passersby, displaying your company info, menus and special promotion to entice them to your business. Unlike LED boards this flat panel screen has a full HD display so can show custom posters, banners and play your videos, you can even hook it up to a pair of speakers for the full audio-visual effect. Running on an Android interface you can pair the device to you Smartphone via a built-in Wi-Fi function and use the clever canvas app make eye-catching messages and designs for your customers. You can even schedule messages, greetings, and promotions to appear throughout the day bringing you a diverse range of marketing and promotional options. You can update your signage instantaneously, no more posters and trips to the printers. Take you signage into the 21st century with this intelligent multimedia sign and see the footfall to you business skyrocket. This intelligent 27-inch sign comes with a 12 months warranty, brought to you by the leader in electronic signage as well as wholesale electronic gadgets..